Unless you live under a rock (or at the bottom of the Marianas Trench) you’re aware that it's Shark Week. In a tradition almost as revered as the Super Bowl, Discovery channel is filling every minute of it with over-the-top programming about the dorsal-finned apex predators of the ocean. Our fascination with Shark Week seems to be rooted in the same thought process behind why we enjoy scary movies so much: its fun to freak ourselves out from the comfort of our couch. We squeal in terror, then laugh as a great white gnaws a cameraman’s GoPro because we know we’re in no real danger. Discovery’s special from Wednesday night, ‘Zombie Sharks’, is a perfect example of that vicarious thrill. The name makes it seem like it should be on the Sci Fi channel right after ‘Sharknado 2’, but its not actually about zombified, undying sea predators. The show focuses on a state called “tonic immobility”that researchers have been using for years to study sharks both in the wild and the laboratory. 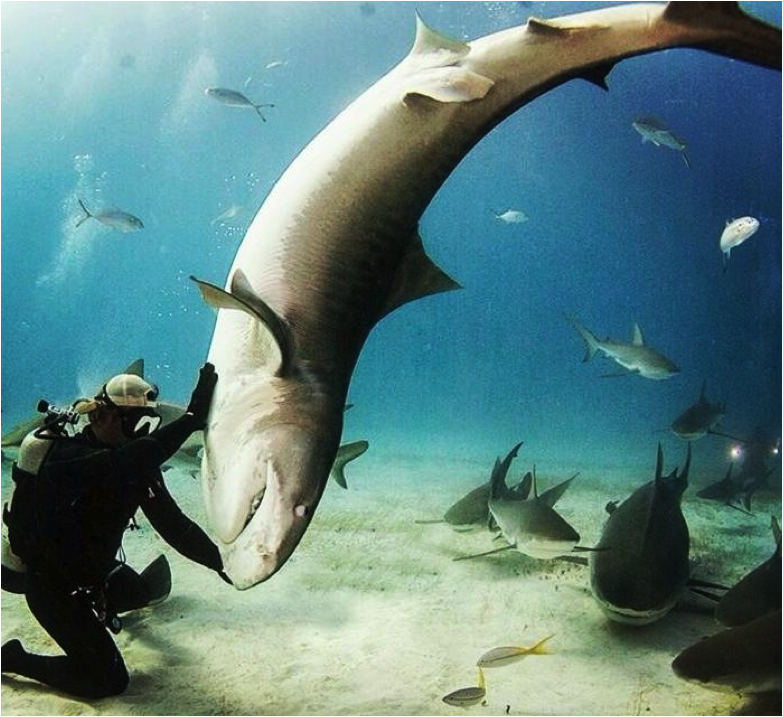 More specifically, a professional diver getting very close to sharks and touching them to induce this state on camera. If “tonic”reminds you of “catatonic”, you’re very close. The effect of tonic immobility on sharks is similar to a catatonic human. Once the effect is triggered, the shark will immediately zone out and become unresponsive, as if it were sleeping. It can last minutes before the shark will rouse itself and start swimming again. Researchers who study sharks will often purposely induce them to stop their movement, then tag them before releasing them back into the wild. Its also been used to test the effectiveness of shark repellants by inducing tonic, then exposing the shark to the repellant being tested to see if it “wakes”them from the state. So what could make a shark zone out? Apparently, flipping it upside down. Another theory is that TI is somehow involved in a shark’s mating process, making it easier to fertilize the females eggs. Because of the presence of TI in other animals, some also view it as something like the fight-or-flight response; like an opossum playing dead. Overstimulating the ampullae of Lorenzini, the organs that allow a shark to detect extremely faint electrical fields, can also induce TI. Located in the area of the snout and around the eyes, these organs are so sensitive that they can detect the earth’s electromagnetic field as well as the electric fields of living creatures . In ‘Zombie Sharks’we see a diver rub the area under a shark’s snout, then invert the shark to fully induce TI after it has stopped moving. According to ‘Zombie Sharks’, a large number of great whites were mysteriously killed, and TI could be a factor. Though its very difficult to induce TI in great white sharks (because who or what would want to try) the special theorizes that orca whales may have figured out how to use it to hunt and kill the great white. If an orca were to ram a shark from beneath and turn it over, holding it upside down with its jaws to keep the shark in TI, even a great white could be killed with relative ease. Sharks need constant motion to pass water through their gills, so even if the orca didn’t eat it, the shark could be suffocated by being kept immobile. Whichever side of the argument you come down on, its probably best to leave the handling of sharks to professionals. Please don’t go try and flip a great white over unless you’d like a posthumous Darwin award.